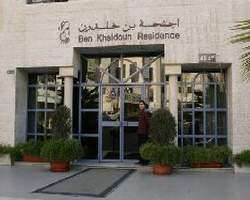 Ben Khaldoun Hotel Suites (BKHS) is located in the heart of the medical, and diplomatic district of the capital city Amman , offering high standard of services and enjoying a fine reputation for a highly efficient and friendly personalized service. BKHS caters to guests and accompanying family and friends on health visits in Jordan and the famous Al Khalidi Medical Center (KMC). BKHS is situated close to KMC and the main shopping centers; 25 km (14.8 miles) from Queen Alia International Airport..
Modernly and comfortably furnished Junior, Executive, Family and Royal Suites – include a spacious lounge with or without balconies and a kitchenette. Check in - 2:00 PM, Check out -12:00 noon. TV/Satellite channels with remote control. My Morning Ritual with a rich buffet selection of items, including Healthy, Continental, Arabic, English and French Breakfasts. A wide variety of oriental and international choices, buffet and " la carte ", to make your breakfast, lunch or dinner a whole and a delightful experience. Special function : buffet lunches and dinners.